Stop-Go Light – A suspended stop and go signal was ordered for the City of Minot in August of 1939. Some years before, I believe it was in 1934, a post type signal was tried in Minot. It was located at the intersection of Main Street and Central Avenue. The use of this signal was discontinued as most drivers ignored it and a number of drivers ran into it. The installation of the signal light was an experiment at the intersection of 2nd Street and 4th Avenue Northwest, (now known as Broadway and 4th Avenue), at the north end of the overpass. The signal weighed about 115 pounds and was equipped with red, yellow and green lights. It was timed with 30 second intervals on the north-south lanes and 20 second intervals on the east-west lanes. The signal went into operation on September 16, 1939. Motorists were given time to get used to the signal. Violators were not arrested on the first day. The signal was in operation 7 days a week, (yes, Sundays included), from 7 am to 1 am. 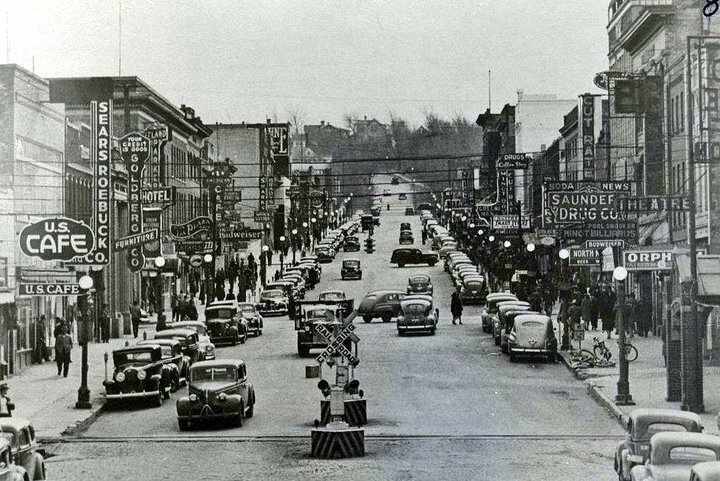 The experiment proved to be successful as signals were also ordered for: Central Avenue and Second Street West, Central Avenue and Main Street, Central Avenue and Third Street East, Main Street and First Avenue and Main Street and Fourth Avenue, (Burdick Expressway.) By the end of 1939, these additional signals were installed and operating.